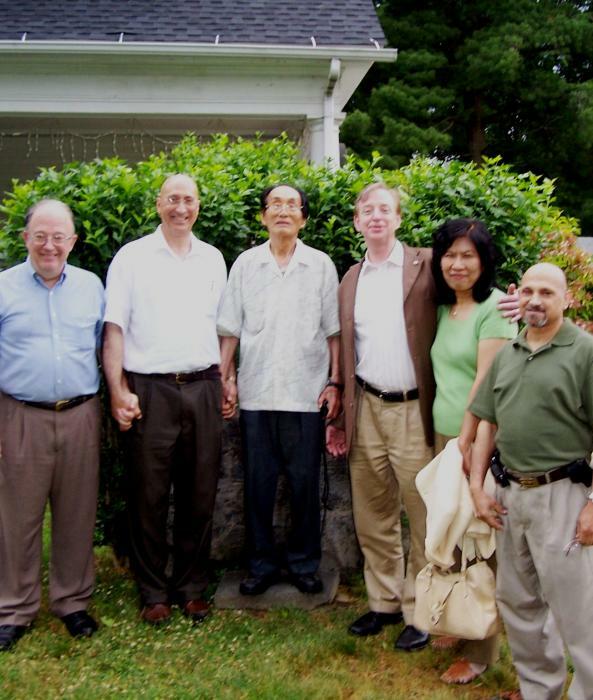 A group of UTS grads convened at "Grandpa" Dr. David S.C. Kim's Poughkeepsie home yesterday. Per Grandpa's desire, the first Sunday of each month is dedicated to such meetings that commence at 11 AM. As Grandpa Kim comes from a lineage of generals, it is important to stress that meetings starts at 11 AM sharp! Grandpa's 3 hour lesson contained the normal full spectrum that ranged from practical understanding of healthy God-centered sexuality -- where God is invited as the third person in the couple's trinity in holy sexual love (you mean someone is looking !!) to phenomenology on the pristine status of creation before the Human Fall. Other salient topics included practical family counseling tips from James Dobson's Focus on the Family and other current sources highlighting that we are currently in a culture war -- and what to do about it to protect exposure to "bad" wisdom out there. He makes it quite clear that he likes to make such meetings interesting, varied, and useful so that inspiration might come to all participants and that the mind might warm-up and be renewed. My experience and participation in such meetings is that Grandpa Kim "still delivers the goods". Not wanting that we westerners lag behind on current Unificationist intellectual conversations presently originating from Korea and Japan, one exceptional service he provides to us is to translate the latest Korean texts on Father's current internal speeches and comments to the membership in Asia (not readily available elsewhere). When I first arrived at his home at 10:30 AM, I knew he would be prepared to greet us at the front porch. There he was sitting in his chair as a General George Washington sitting on his white horse during America's founding history. However, his voice was weaker than usual. His walking and movement less stable and more frail. As others began to assemble in his living room and as we commenced and progressed through our morning service, I noticed a step-by-step progression on the strength in his voice, stamina, energy and his entire being with each step of the way. He would come alive and then take the lead and many times would say, "Are you with me?" as he led us in his morning brief. Bottom line: he needs us to maintain his health. So, if at all possible, please be with him, if you can, as you will be a blessing to Grandpa and be blessed as well. Yes, if not a village, it does indeed take a clan or tribe to get things done. The crescendo of the Sunday messages and teachings normally occurs during our ceremonious luncheon at his favorite restaurant in Poughkeepsie where we roll back our heads and shout-out hearty conversation and laughter that I know God relishes in. Grandpa Kim normally expounds on giving each person some nugget of advice that is always on the mark -- and as for me, I know I needed to hear -- that coupled with the customary round-the-table sharing on the Confucianist wisdom latent in the fortune cookie ceremony, it is a delight to behold. Bottom line: I need him and we need each other to maintain our spiritual and physical health. He did say that no one is doing what he is doing. If not we, then who will continue in his steps? My understanding is that Mrs. Kim is in an elderly care home in CA under the care of her family. I don't know more that that, or if she is visited by her family there, how often, the assessment of her medical condition, whether or not church members visit her, etc. Perhaps a sister might investigate and report on her findings. Might it not be a good idea to have husband and wife meet again? I know that Grandpa does not want to travel via airplane. What to do? Live satellite streaming from each location where they can talk with each other and see each other? Suggestions are welcome. Many heartfelt thanks for all your contributions to the restoration of the Kim's house. Toilets are done. New Roofing is done. Someone just painted the outside white columns of the porch. 4. Purchase humidifier for basement. 1. Forming a think tank and providing forums among Unificationist scholars and other scholars thus re-awakening the New ERA movement that was born at UTS during its Golden Age. 2. Participating and contributing to the development of the Barrytown Campus. 3. Contributing to expansion of extension programs. 4. Contributing to the economic development of local and regional areas via job training, and teaching and re-tooling students with marketable skills, providing venues for continuing education, etc. 5. Legally creating within the non-profit umbrella of UTS AA, a for-profit development arm with the initial tasks of finishing up all the left-over work that needs to be done to the HK house, then to build a presidential archive, library and research facility in honor of Grandpa Kim. Other work in mind is to create a Community Housing Development Organization working with HUD. 6. At Grandpa Kim's last birthday celebration I shared a vision in creating, renovating and/or adding to the HK house an addition that would serve as a presidential archive, library and research center for international and inter-religious studies -- in honor of David SC. Kim. Based on zoning and other factors, whether this can be done on this site or other site will be explored and does not present insurmountable challenges. One way or another, an edifice that honors Grandpa Kim's legacy is in order. As always, please also include your e-mail address for tax-deductible receipts and include your mailing address and telephone so that we can update our alumni records.